Let me introduce you to my Swirling Medallion Quilt, my entry into the baby quilt category of the Blogger's Quilt Festival. If you are a new visitor to my blog from the festival, welcome and I hope you will take a minute to look around. Thank you to Amy from Amy's Creative Side for hosting the festival. Swirling Medallion is about 42" square. She was made following the Swirling Medallion Quilt pattern in Quilting Modern, which is a book by Jacquie Gehring and Katie Pederson, although I adapted the patter by adding some extra rounds . I first introduced this quilt in this blog post where you can read more about her construction. For this Blogger's Quilt Festival post, I though I would share a bit about the inspiration to make this fun little quilt. I had bought a bundle of Heather Ross's Briar Rose line of fabrics with no plan at all for them. I carried them off to the coast for my summer vacation. While I was walking the beach with my dog, I kept looking at the ripples in the ocean caused by tossing in stones and by bigger rocks sticking out of the water. I had brought my copy of Quilting Modern with me on vacation as I wanted to work on some improv projects. So the swirling medallion pattern, the bright Briar Rose prints and the ocean ripples all came together and I made this quilt. The quilting is also a diamond swirl out from the centre, slightly off kilter and not perfectly evenly spaced, in the modern industrial style I like. This picture above is before washing. As always, for me the texture added from washing completes the design. And it adds even more beachy references for me: waves, sand, driftwood, eroded rocks and cliffs, and the original swirls that form when you toss a rock into the ocean. For the back I used a Kona yellow - I am not sure which one - and some more Briar Rose. I machine stitched the binding using the method my friend Marianne from The Quilting Edge patiently explained to me over a couple of lunches - she also has a tutorial here. There are not really strawberries at my beach but the blackberries grow in abundance. So this quilt is yet another of my quilts inspired by the ocean and the beach, despite its lack of beach colours and the wrong kind of berries. Hakuna matata, it was made on my island, it is full of fun and movement, summer sun and smiles, swirls and texture - clearly it is about the beach. I hope you enjoy this quilt and all the others at the Blogger's Quilt Festival. ps, The Amazon links in this post are affiliated Amazon links. 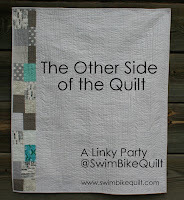 Katie at Swim, Bike, Quilt has invited people to share the backs of their quilts. So I thought I would collect the pictures that I have of the backs of my baby and larger size quilts. In making this post I also learned that I did not keep photos of all my quilt backs, especially the ones that are just plain. That one above is the back of my ROYGBIV Log Cabin quilt. I still want to make a quilt front like that one. This quilt was made for my friend Claire. On the Tiles. This one is at the island house. Liberated (emergency) Baby Quilt. Gifted to a friend's lovely baby. Party Rings. This one is currently off at University with my niece, and I am so glad she would pack it and take it miles from home. No Primary Colours. This one has been abducted by my son. Kaleidoscope. This one is with my nephew, who is also at University. Don't ever doubt that young people love getting a quilt made just for them or that they will bring it along to wherever they are living. Puppies, Boys and Monkeys. This is quilt was made for my youngest son and is on his bed. Lime green quilt - an Irish Chain on the front. This one is also on the coast on my bed. Magnolia Quilt. A gift to a friend. Pink Zig Zag Quilt. This quilt is the first I ever made, it started the whole adventure. Rainbow Warmth. Donated to Quilts Recover. Turquoise Ocean. Also on the coast, on a bed. Supernova. A gift to another friend. King Size Mod Pop (and here too)- I am not sure I ever settled on a name for this quilt. It is one of the quilts that I use on my bed. Red (and here too). She lives on the coast. Butterflies (and here too). Gifted to another friend. Whitewater. Gifted to a my niece's baby - great niece maybe, she is great anyway. Echo Stained. She lives here. Scrappy Trip. This one gets dragged across the country so that there is a car quilt on long trips. Octagonal Orb. Donated to Siblings Together. Swirling Medallion. She lives here. Granny Squares. On my lap right now. Cycles 2. Soon to be on the wall, she just needs a hanging sleeve. I am going to have to photograph a few more quilt backs to complete my set. You can also view all these quilt backs on Flickr here, and if you want to see the fronts again, just click the names of the quilts. I have to say that this exercise of collecting all my quilt backs has made me happy. I often feel stuck at the making the back stage of a quilt, but it looks like my quilt backs are often more interesting than I remembered. Go ahead, you can share your quilt backs too, and see what other folks have been coming up with. Cycles 2 is the second quilt in what might be a series of Cycles quilts. My first Cycles is here. Cycles 2 is 37.5" x 39" after washing. She is made from Kona solids and Essex linen, there is Kona white on the back and the binding is Essex linen. I hand stitched the binding. A commenter asked me about my term industrial modern matchstick quilting. I was inspired to use matchstick quilting by Jacquie Gehring, who blogs at Tall Grass Prairie Studio - her matchstick quilting is very evenly spaced and stunning. My spin on it is to use the wobbly unevenly spaced lines I often use in straight line quilting even in these tight quarters. I am sure others have done this but the term industrial quilting is one I made up to describe these intentionally wobbly lines that create uneven texture. Having made it up does not mean that someone else is not already using it too, so let me know if you have seen it before. I think I will link up to one or more of the show off your finish links this week. You know that there will be wonderful inspiration at each of those links, do check them out - Fabric Tuesday at Quilt Story, TGIFF at Quilt Matters, I Quilt at Pretty Bobbins and Finish it up Friday at Crazy Mom Quilts. I will add buttons as I add the links. 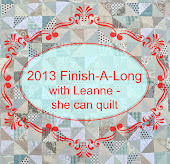 Oh, and she is also my first finish from my Q4 Finish-A-Long finish.